Xiaomi was one of the first smartphone manufacturers to adopt themes, delivering the MIUI theme store back when this wasn’t a common feature. Not sure how to use themes? We’ve got you covered with a look at the storefront and how to install MIUI themes. You’re free to browse the theme store without a Mi account, but you’ll need an account if you want to actually download them. Visit account.xiaomi.com to create your account, or sign up with your Facebook account. Alternatively, you can sign up via your phone settings (settings > Mi account). Either way, make sure you have a Mi account if you want to use themes. Once you’ve got your Mi account sorted, you’re able to search for and download MIUI themes. Tap the themes app to launch the store. The themes home screen is pretty well-organized, with a rolling list of categories at the top of the screen. There are also permanent categories devoted to new entries, most popular themes, and editor’s picks. Scroll down and you’ll find categories for daily recommendations, boys/girls themes (go figure), classic picks, good design, top 100 for the previous month, and various other picks. Spotted a theme you like? Tap on it and you’ll see a green download button docked at the bottom of the screen. Tap the button and then simply wait for the download bar to fill. Once the download has finished, the download button will then turn into an apply button. Tap it to apply the newly downloaded theme to your phone. That’s it; you’ve now got a new theme. If you’ve downloaded several themes and would like to see them all in one place, you’ve got two options. You can visit the themes app and tap the smiling icon (it’s the third one, in the bottom-right corner of the homepage). From here, you should see a themes button with the number of downloaded themes too. The second way to view your downloaded themes is to visit settings > themes (it should be under the “personal” section). You’ll then be presented with a my themes section at the top of the screen, as well as a few recommended picks below. To apply any of your previously downloaded (or preinstalled) themes, you simply tap on the theme in question, and choose apply. To delete a previously downloaded theme, the easiest solution is to visit settings > themes, and then tap the theme in question. From here, hit the garbage can icon in the top right corner to delete it. Preinstalled themes can’t be deleted in this manner, however. If you’d like to delete multiple themes in one go, you should visit the themes app and tap the smiling icon (bottom-right hand corner of the home menu). You should then tap the themes button in the top left to view your downloaded themes. From this menu, tap and hold on a theme, then tap other themes to select them. You should see a delete icon appear at the bottom (as seen in the above image) — hit the icon to delete all your selected themes in one go. Xiaomi’s storefront has a number of ways to help you find the most suitable MIUI themes. Of course, there are the pre-existing categories, but one of the better solutions is the keyword/tag system. Tap on a theme and you should see a list of tags just below the “summary” or “updates” fields. Tap on these tags to find themes with the same tags — think of it like a hashtag system. For instance, the theme in the image above has “black” tags, so tapping them will take you to other themes with dark aesthetics. If you liked a specific theme, you might want to see what else the designer has done. This is done by hitting the designer name and arrow at the top of the screen just below the name of the theme. Maybe you like one theme’s dialer menu but hate everything else. Perhaps you love one theme but would prefer to swap out the lock screen for something else. Either way, you can mix and match MIUI themes via the app itself. To do this, visit the smiling icon from the home screen (bottom right-hand corner), then tap on the customize theme option. From here, you’ll see the various customization options, ranging from lock style and status bar to icons and favorites tray. Want to change the dial pad theme? Then tap on dial pad and choose the available options. Simple. Do note that you have to download themes to get more customization options. If you only have three downloaded themes, you’ll only get three options for changing your lock style (default options aside). Once you’ve got your theme all customized, you can save this specific combination by tapping the back up theme option at the bottom of the customize theme screen. You’ll then see a theme backup option in each customization field, so tap every instance of theme backup in each category to get the specific combination again. It’s a pretty cumbersome approach unfortunately, so we hope Xiaomi delivers a quick “apply backed up theme” option instead. 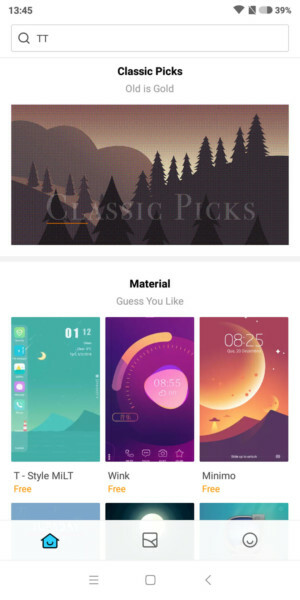 So now that you’re familiar with MIUI themes, it’s time to take a look at a few examples of what’s possible. Of course there are thousands of themes to download, so even if these don’t tickle your fancy, you’re bound to find something on the storefront. This is the number one theme right now, according to the top charts listing on the app. The theme stands out thanks to its leafy wallpaper, showing pink leaves, but the icons are also pretty unique, using rounded squares and a neon visual style of sorts. Another popular option is the MyStyle theme, which tosses in generous lashes of black and blue to create a moody theme. We see stock Android icons for the most part, albeit with square icons. Otherwise, I quite like the notification shade, which uses blue and white colors, and circular icons. Dark themes/wallpapers are fantastic if you’ve got a phone with an OLED screen, giving you deep blacks and saving battery life in the process. Download this theme if you’re looking for an OLED-friendly mode — or if you want a retro-inspired notification shade. Need more Xiaomi in your life? That’s it for our MIUI themes guide, but hit us up in the comments section if you’ve got more tips or great themes to share! Looking for more Xiaomi-related coverage? We’ve picked a few articles for your convenience, which can be found below. MIUI 10 global beta details revealed: When will your phone get the update?